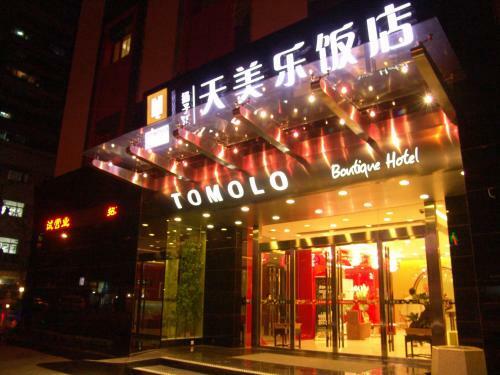 Yangtze River TOMOLO Hotel (Wuzhan Branch) Wuhan | Low rates. No booking fees. Yangtze River TOMOLO Hotel (Wuzhan Branch) offers modern rooms with free Wi-Fi and wall mount flat-screen TVs. Approximately 500 metres from downtown Wuhan, it has a buffet-style restaurant, bar and a business centre. Book a room at Yangtze River TOMOLO Hotel (Wuzhan Branch) Wuhan online and save money. Best price guaranteed! Yangtze River TOMOLO Hotel (Wuzhan Branch) Wuhan: low rates, no booking fees. The hotel is located at 53 Fouth Minyi Road (Minyi Si Lu), Qiaokou District in Wuhan, Wuhan Shiqu, Hubei, China – see Wuhan map ». Hotels in the neighbourhood of the Yangtze River TOMOLO Hotel (Wuzhan Branch) Wuhan are sorted by the distance from this hotel. In the following list, large airports nearest to Yangtze River TOMOLO Hotel (Wuzhan Branch) Wuhan are sorted by the approximate distance from the hotel to the airport. Airports near to Yangtze River TOMOLO Hotel (Wuzhan Branch) Wuhan, not listed above. In the following list, car rental offices nearest to Yangtze River TOMOLO Hotel (Wuzhan Branch) Wuhan are sorted by the approximate distance from the hotel. The following list shows places and landmarks nearest to Yangtze River TOMOLO Hotel (Wuzhan Branch) Wuhan sorted by the distance from the hotel to the centre of the listed place.